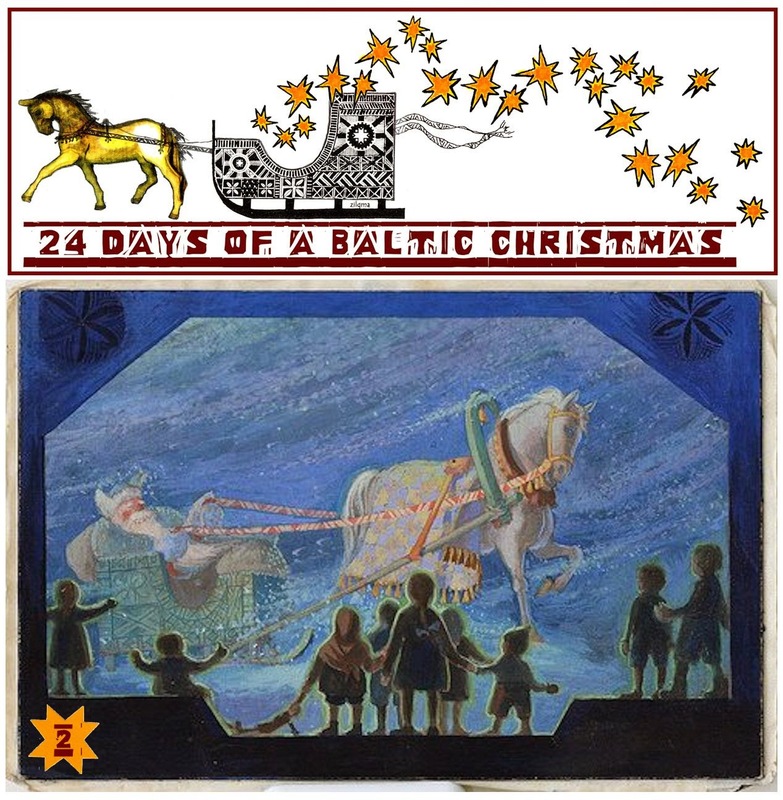 Day Two of 24 Days of a Baltic Christmas is by Elga Ozols. Elga is the author of the self-published National Novel Writing Month novel "Holly, The Captain and Handsome Jack" and an occasional contributor to Latvians Online. Remember Christmas when you were little? The air was crisp and cold, the house smelled of pine and gingerbread cookies, the presents were under the tree in bright, beautifully wrapped packages, and every house in the neighborhood was covered with twinkling yellow lights. One day, just as you thought you would burst with anticipation, Santa Claus showed up at the door, his big, pillow-shaped belly clad in red velvet, his white beard hanging loosely from his red cheeks, his "Ho Ho Ho!" bellowing through the air. Remember, as you jumped for joy, how he entered the room, shaking a handful of sticks and screaming, "Where are all the bad children? Who wants the sticks?" No? Just me on that last part? Oh. When I was asked to write about Latvian Christmas, I realized I'm not sure what a "Latvian Christmas" is. Which traditions are specific to my Latvian-American family, and which are more universal? My family goes to church and does presents on Christmas Eve instead of Christmas morning, but is that just us? People around the world do the Christmas-tree thing, right? And sing Christmas songs? And, of course, everybody knows Santa Claus, the friendly guy in the red suit who-- wait a second. It suddenly dawned on me that Ziemassvētku vecītis ("Winter-Holiday Old Man," the Latvian name for Santa Claus) isn't really all that friendly, at least not at first. In the Washington, D.C. Latvian-American community, Ziemassvētku vecītis makes his appearance each year at the skolas eglīte (literally "school Christmas tree," our version of a Christmas pageant). He looks pretty much like any other Santa Claus, except with a much cooler belt (beautifully woven with Latvian designs from wool instead of boring leather and buckle). His sleigh is pulled by "helper elves" (embarrassed teenagers), and yes, he threatens naughty children by waving a handful of branches, or žagari. He appears without warning at the back of the performance hall and shouts his way to the front, where he sits sternly on an elevated wooden throne and calls up students from the Sunday school, class by class, to recite poems in front of the crowd before receiving a present. Looking back, public examination and threats of violence--two hallmarks of what I consider to be a traditional Christmas--are noticeably absent from my non-Latvian friends' memories of the holiday. But these things never bothered me. What bothered me, a self-righteous, social-crusading seven-year-old, was that Latvian Santa was so bad at his job: He was supposed to weed out the naughty kids for a spanking, but he never did! Each year I would think, "Ha! So-and-so pulled my hair in class last week. Now Santa will call him out, and vengeance will be mine!" But Santa never actually beat any kids. Even the really mean ones. According to Santa, we were all little angels, which, I knew even as a seven-year-old, is just plain not true. I also recall frustrating, tedious nights spent with my extremely patient mother, trying to memorize some really long Christmas poem. I was very bad at memorization, but I tried my hardest, because otherwise Santa wouldn't give me a present. And then, come performance time, other kids would go up and recite just one or two lines! Or recite the exact same poem they'd used the previous three years! Or they would read off a crib sheet hidden (poorly) in their hand! Surely Santa wouldn't give them a present, right? Wrong. Everyone got a present. Everyone. Santa treated us all exactly the same, no matter how much we misbehaved or cheated the system. Clearly, Santa was not a student of criminology, since he never realized that empty threats of punishment serve no deterrent value. And then there were all my freeloading American friends, who didn't even have to think about memorizing poems, and got tons of presents for doing nothing. Come on, Santa, get it together! Being faced with a slacker Ziemassvētku vecītis was even more upsetting because, according to my child logic, the Latvian Santa was the real Santa, and the shopping-mall Santa was a phony. My reasoning, of course, was that real Santa would need to be multilingual in order to travel all over the world. Shopping-mall Santa couldn't even understand what I was saying when I tried explaining to him, in Latvian, what I wanted for Christmas that year. So shopping-mall Santa could go ahead with his racket of taking photos with kids, blatantly ignoring their requests (I'm still waiting for my Mr. Potato Head, mall Santa! ), and charging exhausted parents ridiculous amounts of money. I was okay with that, because we all knew shopping-mall Santa was a hack. But Ziemassvētku vecītis was supposed to have integrity. And in my little-kid head, that meant he should have either used those žagari, or dropped them from his repertoire altogether. It turns out that in recent years, Ziemassvētku vecītis has been abiding by the latter part of my childhood dictum. An inside source who knows the current D.C. Latvian-school Santa tells me that sticks aren't part of the act anymore. And with good reason. Considering the current outrage over Adrian Peterson, the NFL player who disciplined his son with a switch, it's difficult to believe that just two decades ago we openly laughed at the idea of Santa beating children. I even found myself wondering whether I had remembered it correctly. My mother was surprised that I had any recollection of žagari, because she claims the branches had been dropped from Santa's appearances by the time I was in school in the late 1980s. She recalls no žagari from my youth, and only occasional žagari from her own youth. So I wondered, just how ingrained are žagari to the image of Latvian Santa? The internet would surely know the answer. The first entry that popped up when I searched the web for "Latvian Santa" was www.balticsantas.com, which sells various Latvian and Latvian-inspired items, most notably little Ziemsvētku vecīši figurines. I don't know anything about Maija, the woman who runs the site, but her handcrafted Santas are pretty amazing. Each one carries adorable little props, from baskets full of pīragi (dumplings) to birdhouses, kokles (traditional musical instruments) and miniature Christmas trees. But no žagari. I clicked on every single one of Maija's Santas, and while I thought I spotted some žagari a couple times, it always turned out to be a red herring: skis, or a walking stick. Further internet searching led to just a single reference to the mean Ziemassvētku vecītis from my youth, on the site www.santalady.com (maintained, coincidentally, by another Santa figurine artist): "His outfit was similar to the common Santa in US, except he also carried bells and a birch switch. The kids made a presentation: music, sing, recite poem or tell a story to earn something from the sack." So while the žagari I remembered from my childhood were real, they didn't seem to be crucial to Latvian Santa's image, and they certainly were never actually implemented to hit children. While goody two-shoes, seven-year-old me found this fact disappointing, adult me sighs with relief. I still wondered, though, where the branches had come from. My initial theory was that the idea of a threatening Santa was brought into the Baltic region around the 13th century by invading Germans, who set to work replacing the local pagan winter-solstice celebrations with a Christian Christmas. The Germans have a history of using terrifying tales to scare children into good behavior: See the popular collection of children's tales Der Struwwelpeter (Shockheaded Peter), in which children burn to death for playing with matches and get their thumbs chopped off for sucking them. Saint Nicholas himself makes an appearance, dunking three boys in black ink as punishment for making fun of a dark-skinned boy. It might stand to reason that similar dark tales got woven into the Latvian Christmas tradition, especially considering that, for centuries after Germans first conquered the area, the switch was widely used as punishment against Latvian serfs by German lords. Digging further into the internet, I discovered that my recollection of a violent Christmas figure is not as unique as I thought. Many European cultures have a "scary" Santa-type character, though they tend to separate the two primary Santa roles, gift-giver and punisher, into two separate characters, a sort of good-cop bad-cop for holiday revelers. The kindly gift-giver, usually Saint Nicholas, is accompanied by a terrifying sidekick, such as the devil-horned beast Krampus, or France's scraggly, bearded Father Whipper. These mean characters often carry whips or switches with which to beat ill-behaved children, or they give out sticks and coal as gifts; many carry backpacks in which to stuff particularly evil children and take them away from their friends and family. Latvian Santa seems to bear the closest resemblance to the German character Belsnickel, who arrives a couple weeks before Saint Nicholas, has children perform songs for him, rewards them with candy, but threatens to hit them if they reach for the candy too quickly. Notably, much like the slacker Santa of my youth, Belsnickel never quite manages to hit anyone, instead scaring them into good behavior in preparation for the eventual arrival of Saint Nicholas. Perhaps what makes žagari-wielding Latvian Santa unique is that punisher and benevolent gift-giver are rolled into one. It makes sense, then, that his more violent side is fading from use; after all, it requires a certain degree of cognitive dissonance to see Ziemassvētku vecītis as both a switch-wielding bogeyman and a beloved symbol of our happiest holiday. Even the children of Der Struwwelpeter weren't expected to love the witch after she captured them, or embrace the devil after he chopped off their hands. And children are certainly not expected to run up and hug the whip-yielding, kidnapping beast Krampus. On the other end of the spectrum, there's monolingual, American mall Santa, who rides fire trucks, parachutes onto football fields, lives on my neighbor's lawn as an inflatable figure in Bermuda shorts, climbs down chimneys to devour milk and cookies, and delivers PlayStations. Sure, he may not be the "real" Santa from my childhood, but he sure does seem like a lot more fun. But maybe I'm just biased because mall Santa never made me memorize poetry. Thank you Elga! Find Elga on twitter @blondieoz, check out her book Holly, The Captain, and Handsome Jack, and join us tomorrow for a craft project from Dabas Mamma on Day 3 of 24 Days of a Baltic Christmas. What a great post! Paldies, Elga! Brings back so many childhood memories...ugh, did I dislike memorizing poems. Some of my family members and I even wrote little plays to put on in front of the family Christmas tree on Christmas Eve. Favorite one: when three of us (aged approx 7-10) played the wise men, and a 6 mos old relative was drafted to be baby Jesus. I guess I've been in SC too long (and away from the bazāri), because I don't think I've seen one of Maija's Santas... They look to be beautifully crafted! What a great insight into your culture. In Ireland it was just the happy Santa. No evil sidekick or sticks. The gift giving was not hugely lavish. One gift and a "surprise" which was a book. I think the lavish gifting is more a product of the times, and not so much a cultural thing anymore? And yes, despite the switches of Latvian Santas I remember how surprised I was to hear about the French Le Père Fouettard during our expatriation - he was accused of some truly evil deeds!